Below are excerpts of an excellent interview with Kang Jeong-Koo, a longtime activist scholar, with Solidarity for Peace and Reunification of Korea (SPARK). SPARK is a Global Network affiliate group and has been heavily involved in the campaign on Jeju Island to stop the Navy base construction. This interview is done by Christine Hong and was published in Asia Times. You can see the full interview here. SPARK was established in 1994. Many Koreans believed that it was high time for us to end the division of Korea, to realize a reunited state, and to get foreign troops out of the Korean peninsula. Never in our history have foreign troops been stationed in the Korean peninsula for as long as US troops have been here - over 65 years. China, during the Tang dynasty, stayed only nine and a half years. During the colonial period, the Japanese military was here for almost 40 years. In 1958, the Chinese army withdrew from North Korea. By contrast, that same year, the United States deployed up to 1,300 nuclear bombs here in South Korea, only removing its nuclear arsenal from South Korea in 1991. If we think the South Korean people panicked when North Korea had five or six nuclear bombs, how did the North Korean people feel from 1958 through 1991? 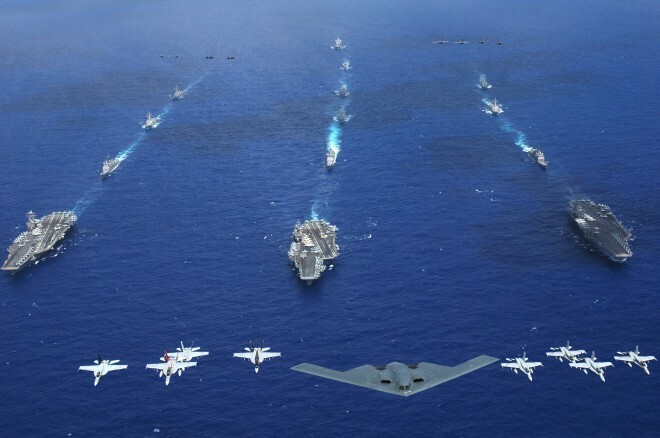 In the greater Asia-Pacific region, we're seeing the United States attempt to preserve its hegemony by using the resources of allied countries. This reminds me of the Libyan war. In the initial stage of the Libyan crisis, the United States intervened but then withdrew. It did not wish to waste its money. Instead, it wanted France, England, and Italy to underwrite the costs of the intervention. The exact same policy applies to South Korea, Japan, India, and Australia. And it doesn't matter that the naval base is, in name, South Korean. 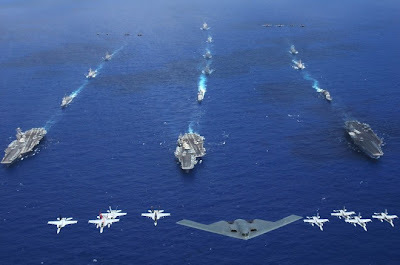 The United States, according to its Status of Forces Agreement and its Mutual Defense Treaty with South Korea, can use at whim and at will any South Korean base. The Korean people know that the naval base at Gangjeong is not for the South Korean Navy but for the US Navy. Look at the Pyongtaek base. Pyongtaek is the nearest US military installation to Beijing and Shanghai. It is only one or two hours away by civilian airplane. Firing a missile would take no time at all. So the US military installations that are the closest to China are the Pyongtaek and Gangjeong bases, which the United States wishes to be built at Korean expense. The same is true of Japan, Australia, Singapore, and India. The stationing of US troops on our soil and South Korea's military alliance with the United States have proved to be the most formidable obstacles to the struggle for peace. It's for this reason that anti-Americanism - understood critically as a people's struggle for the withdrawal of US troops - increases as each day passes. Our country is a sovereign country. We do not want to remain in a subservient or sub-imperial relationship to US military empire. It is both foreseeable and inevitable that in the near future, our people's power will make it impossible for US troops to remain on our soil. - Christine Hong is an assistant professor of critical Pacific Rim studies at UC Santa Cruz. She is a fellow at the Korea Policy Institute and a member of the coordinating committee of the National Campaign to End the Korean War. WHAT HAS BEEN ACCOMPLISHED IN AFGHAN OCCUPATION? My friend Rick Rozoff from Chicago (who runs the Stop NATO list serve) comments on the disaster of U.S. occupation of Afghanistan. Public forum on October 16 in Santa Barbara, California - more info near end of the video. I have been pleased to see just how much anti-war activity there has been across the U.S. during the past week or so. These events have been organized by a myriad of organizations including Veterans for Peace, CodePink, Keep Space for Peace Week, UNAC, and hundreds of local groups. Usually, just weeks before a national election, many activists get distracted by the public relations show. But this time around I see alot less grassroots energy going into campaigns of weak-kneed Democrats. Instead the anti-war organizing, while not large, has been steady and unrelenting in its criticism of both war parties. Obama's poor debate showing appears to have put the presidential race into a statistical deadlock. That means some wavering Dems will return home and vote for the Obamanator. If Romney pulls out a victory we'll likely see a surge of loyal Dems (party first types) return to the peace movement and begin lashing Romney for using drones (something they would not criticize Obama for doing) and other such transgressions. We saw this phenomenon during the presidency of Bill Clinton. Dems abandoned the peace movement after he was elected but we still limped along protesting Clinton's harsh sanctions of Iraq that ultimately led to the death of 500,000 children. When asked about this on the CBS-TV show 60 Minutes (5/12/96), Clinton's Secretary of State Madeleine Albright said without a flinch, "I think this is a very hard choice, but the price--we think the price is worth it." Loyal Dems did not take Albright to task for being a war monger the way they would just a few years later when George W. Bush and his crew of pirates came to power. It's something we talked about while on my recent trip to Philadelphia and Baltimore. The ranks of the peaceniks across the nation have certainly be thinned out during the Obama years but our determination to end these wars remains steady. Like the ocean tides that come in and go out - the peace movement will again swell at some point. Everything we do on a daily basis to keep the peaceful embers alive is more important than ever. The first site we visited was the navy headquarter of the Republic of Korea Armed Forces, Gyeryongdae complex, which is the ‘tri-service headquarters from where all military operations are planned and controlled.’ The Defense Exhibition 2012 from Oct. 10 to 13 just started on the dame day of visit. In its Korean site, it says the purpose of the exhibition is to open the door to the small and middle companies armed with advanced scientific technologies into the defense market and to improve defense industry; to promote the domestic and overseas defense corporation technology and information exchange; and to promote the establishment of the military-government-industry research institute and academy. People having a small rally there where the navy blocked the gate, with two police cars and even a water cannon, denounced the enforcement on the Jeju naval base project, as well as demanded to convert the cost for arms to people’s welfare. It was a very appropriate site to hold the banner on Keep Space for Peace Week and to speak on the arms industry. 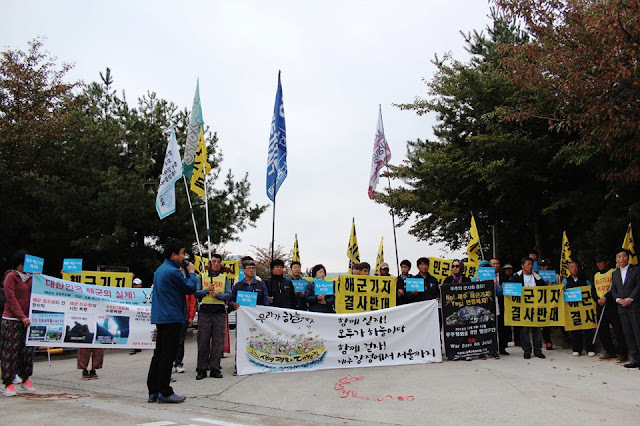 The next site people visited was the Daejeon city hall where the people had a press conference on the SKY Joint action and railroad workers’ strike site in the Daejeon train station. The Korean railroad system is being privatized and workers are suffering for the vicious irregular job systems. There was a solidarity talk meeting with them. Finally the candle vigil was held in the station and many Daejeon citizens gathered to watch the event. The Gangjeong movies and Gangjeong style dance attracted the citizens in Daejeon, which made the march participants and Daejeon activists happy about it. I am just home from Baltimore, Maryland where I spent the last two days. While there I stayed at the home of David Eberhardt who went to prison for nearly two years in 1967 for pouring blood on draft files with Phil Berrigan and two others to protest the Vietnam War. Yesterday Dave took me to the National Great Blacks Wax Museum where I was moved beyond words by the displays of the slave ship passage from Africa and the lynching era (particularly in the American south). I was so deeply touched by what I saw that I found myself writing some words which you can see at the end of this post. Later in the afternoon I joined with other peace activists from the Baltimore area when we went out to the National Security Agency (NSA) headquarters for an hour-long vigil as the workers were going home. We held signs and soon attracted about 4-5 NSA police who asked us each for our name, address, etc. I refused to give any information. We only got one car honk during the hour we stood at the NSA which should come as no real surprise to anyone. Last evening a dozen folks gathered at the home of Max Obuszewski for a pot luck supper and some political discussion. For the third time during the trip I found us talking about the excellent book by Jim Douglass called JFK & the Unspeakable: Why He Died and Why it Matters. In a few words, this book tells the story about why and how the military industrial complex had JFK killed. 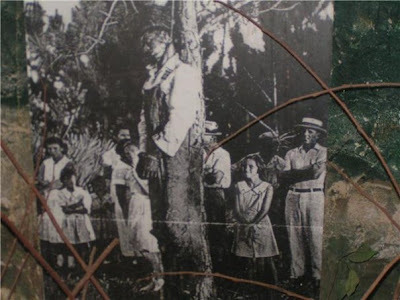 The book is part history, part mystery story, and part moral lesson. I did a review of it a couple of years ago and you can read it here. I am grateful to those who hosted me, particularly Bob Smith at the Brandywine Peace Community who initiated the trip and shuttled me for the two days in the Philadelphia area. call this shattered, divided, broken, and corrupt land. of streets with boarded up empty houses. '$ecurity export' they call it with pride. say he was 5th generation "warrior". For whom I asked the radio? we have become machines ourselves. help pull the triggers these days. we can kill from space. and we don't seem to care. The Drone Die-in Protest was directed by Phui Yii Kong, a second-year Bowdoin College student from Malaysia. A group of two dozen local activists played the parts of killer drones with warmongering names and innocent civilians going about their daily lives. Others carried signs and handed out literature. The protest was organized by Lisa Savage, director of Code Pink State of Maine to protest the use of unmanned drones killing innocent civilians around the world, and President Obama's use of drones to assassinate "terrorists" on his kill list. Performances were held at One Canal Plaza in front of the offices of Senators Snowe and Collins, in Congress Square, and finally in front of President Obama's campaign headquarters on Forest Avenue. The protest was coordinated with anti-drone protests in the U.S. and Pakistan as well as with Keep Space for Peace Week sponsored by the Global Network Against Weapons and Nuclear Power in Space. 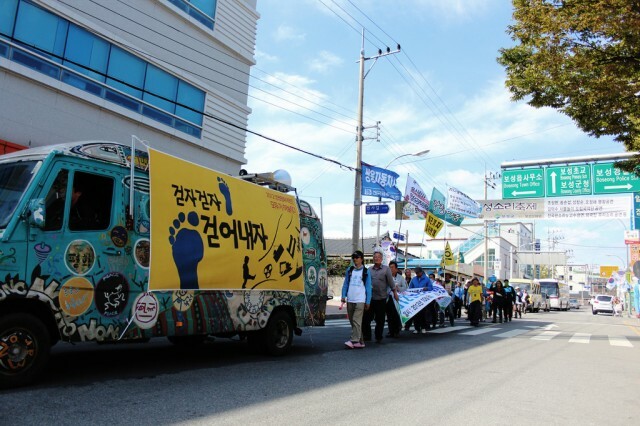 The Grand March for Life and Peace continues across the Korean mainland. At the very same time the Pentagon and South Korea puppet government has announced an expanding missile arms race in the region. The U.S. claims it is working for peace but keeps building and deploying more weapons of war and increasing tensions in the Asia-Pacific. I am in Baltimore now (not to go to baseball games) but to join a protest at the National Security Agency (NSA) HQ today along with local activists. The NSA is the agency that is in charge of intercepting all of your phone, fax, and email communications globally. They have downlink stations in places like Menwith Hill, England and Pine Gap, Australia. It's 'big brother' on steroids. I must confess that I have watched the Oriole-Jankees playoff games on TV the last two nights. They have each won a game and now the series heads to New York City for the next three games. I spoke twice in Philadelphia area - on Sunday night at the Springfield Quaker Meeting House and then on Monday during the day at the American Friends Service Committee offices in downtown Philly. Both went well. Yesterday in Philly at my mid-day talk a woman named Clarissa Rogers came and told me she was one of the "Cassini 10" who in 1997, when NASA launched 72 pounds of deadly plutonium-238 into space, were arrested for chaining themselves to desks in the office of one of their senators in Burlington, Vermont. It's amazing as I travel how many people I meet who played some role in that dynamic three-year campaign we organized from Florida as we tried to prevent that dangerous launch. And the fact that 15 years later folks are still proud and talking about their roles in the effort speaks volumes to how much it meant to everyone. In the morning I head back to Maine.